“I just found a critical bug … sorry, the launch will be delayed again.” Does it sound familiar? We have all relied on time tracking to hit a live date. Time can be easily measured and assigned to project milestones, but understanding human behavior is essential. is the development pace sustainable? Elastic Tribe prioritizes behavior over time because people drive projects. It can be challenging to manage behavior because of unpredictability and difficulty to measure. Remember that team performance can be derailed by an unforeseen communication breakdown. There are two components to energy: yours and the team’s. Both require attention for great things to happen. Learning how to track team energy has been challenging. Sometimes a project duration is short, team composition is hybrid (permanent and contractors), or personalities do not blend enough. Over the years I have used common sense, observed team behaviors, read great books (e.g. Drive by Daniel H. Pink) and received great advice from project managers. For example, some teams lack a clear business purpose or have long forgotten the why. If the why is unclear from day 1, executing the what and the how will be challenging. 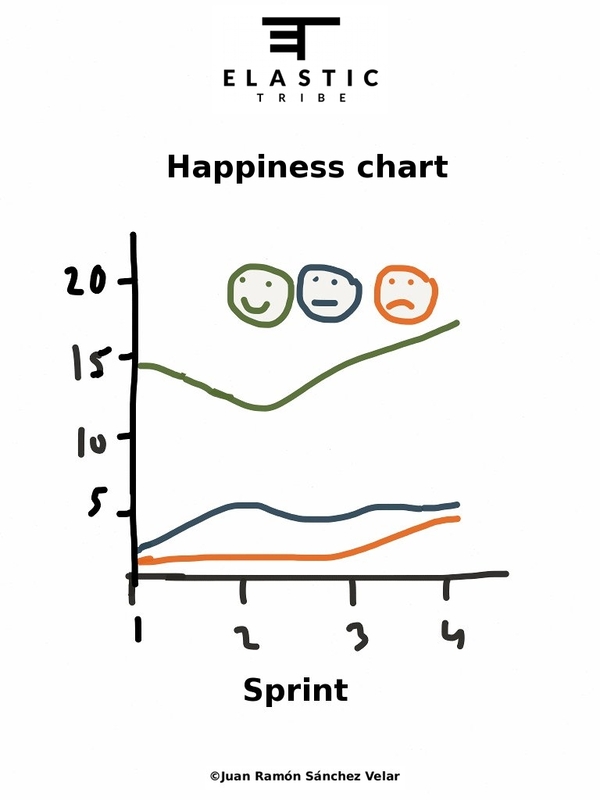 A team energy visualization I have found invaluable is a happiness chart. It brings visibility into the how (behavior) although typically businesses focus on the what (features). A happiness chart can show why a highly productive team decreases in productivity. It can also illustrate when a team has transitioned between growth phases (e.g. from storming to norming). Before the end of a Sprint, team members select only one emoticon per question. The chart displays the total number of selections per emoticon. The Sprint report includes the chart to showcase full project visibility. How do you manage team energy? Thanks to my father who shared with me on the topic of this web site, this website is in fact amazing. Quite interesting. Does ‘energy’ correspond to motivation and how? Energy feeds different states of mind like motivation. For example, a good night sleep or a healthy breakfast will certainly boost your energy level for the day. Higher energy will impact ability to find the motivation to complete high value tasks. Always replenish energy to feed again your motivation. This is a great post and great chart as well! I find often managers forget about the “why” and spend too much time on unnecessary features. Keeping team energy flow directed at activities that directly link back to a clear strategy with evidenced-based evaluation is the key to success. Also, choose teams carefully in order to tightly integrate the energy mix achieve gains here too. Glad you liked the post and illustration! Understanding and protecting the “why” throughout the lifecycle of the project can be accomplished using impact maps (http://www.impactmapping.org/). Behaviour changes in the impact map can be linked to business KPIs. Once a desired working culture is established, finding the right team members (e.g. growth mindset, self-driven, easily adapts to change, etc) with the right mix of personality traits (e.g. introverts, knowledge seekers, outspoken, etc) is critical to build a cohesive team.